Twitter is the best place to find out what's happening and to join the public conversation. With the #LokSabhaElections2019 having just begun, the platform is buzzing with conversation. Polling started on Thursday morning for 91 seats in 18 states and 2 union territories and the conversation on the platform reflected this. 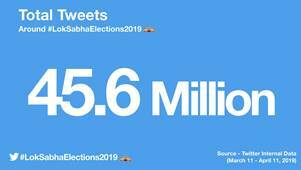 Twitter recorded 45.6 million Tweets related to the Lok Sabha Elections from 11th March 2019, the day elections were announced, until 11th April 2019. Of the 45.6 million Tweets recorded during that period, 1.2 million were Tweeted on April 11th, 2019 during phase one of the 2019 Lok Sabha Elections.